The North County water plant in Florissant, Missouri wanted to move to an all liquid system and turned to Houston PolyTank’s heavy duty tanks to help them upgrade their chemical feed system. 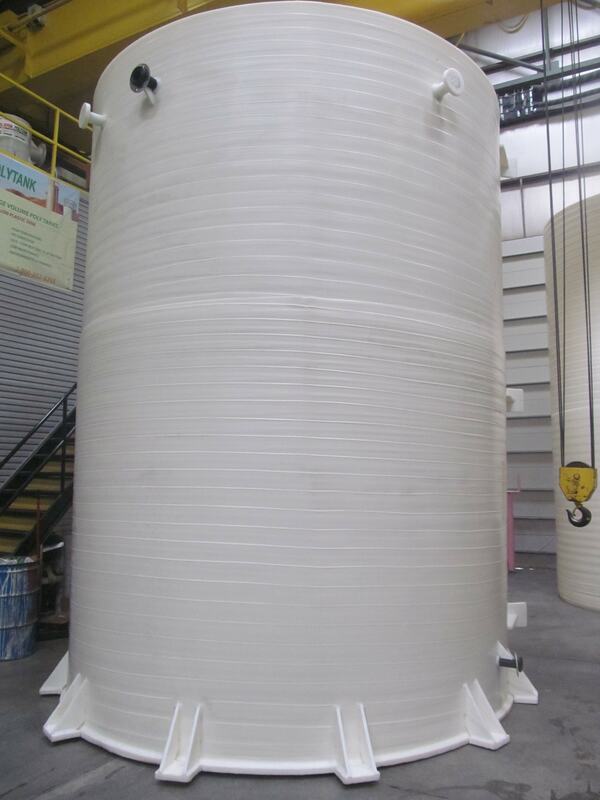 They wanted to move away from being reliant on a few buried tanks that they had, and they needed to upgrade a few rotomolded tanks, so they ordered 14 of Houston PolyTank’s rigid-sided extrusion-wound heavy duty tanks to hold a series of chemicals required for their processes. Because of the harsh chemicals being housed inside, the heavy duty tanks themselves have stainless steel backing rings. There were wind and seismic rated tie downs added to ensure that the tank would not tip over. The necessity for these and the specifications for those tie-downs were calculated by an outside engineer. Lifting lugs make it easier to put the tanks in place, and ladders for the 7,000 gallon and 10,000 gallon tanks allow for access to the top (where the manways are). One of the features that Levi Wright likes best about Houston PolyTank’s extrusion-wound heavy duty tanks (and will probably order on the next group of tanks they need to order) is to have side manways on a tank. This makes cleaning the tanks so much easier, as accessibility in cramped indoor spaces can be a challenge.